On April 25, 2014, you are invited to join CELP for a Continuing Legal Education workshop entitled, Climate Change: The Rules are Changing. We will address current changes and challenges in policies, standards and regulations at local, state, and national levels (and internationally as they impact Washington). Areas of focus will include: shoreline development, public trust litigation; and legal standing status. The event is co-sponsored with Futurewise and the Seattle University Law School. We invite you to view the most up-to-date program and register online through the Seattle University portal here. In a joint, historic proposal to the Bonneville Power Administration (BPA) and the Army Corps of Engineers, the Columbia River Tribes and the Canadian First Nations have laid out a thoughtful, achievable, phased plan to restore fish passage at dams, like Grand Coulee, that have blocked salmon, steelhead and other anadromous fish from prime habitat in British Columbia for generations. This is NOT fantasy. If we want salmon, if we want a commerical and recreational fishing industy in the Northwest–this plan must be implemented. Certainly, we have a moral duty to the Tribes to implement the plan, but we also must do so for the economy and environment of this region. Restoring prime fish habitat in British Columbia is crtical to give salmon, and the fishing industry, a fighting chance as the impacts of climate change manifest themselves over the coming decades. We wholeheartedly support and endorse the proposal’s goals. 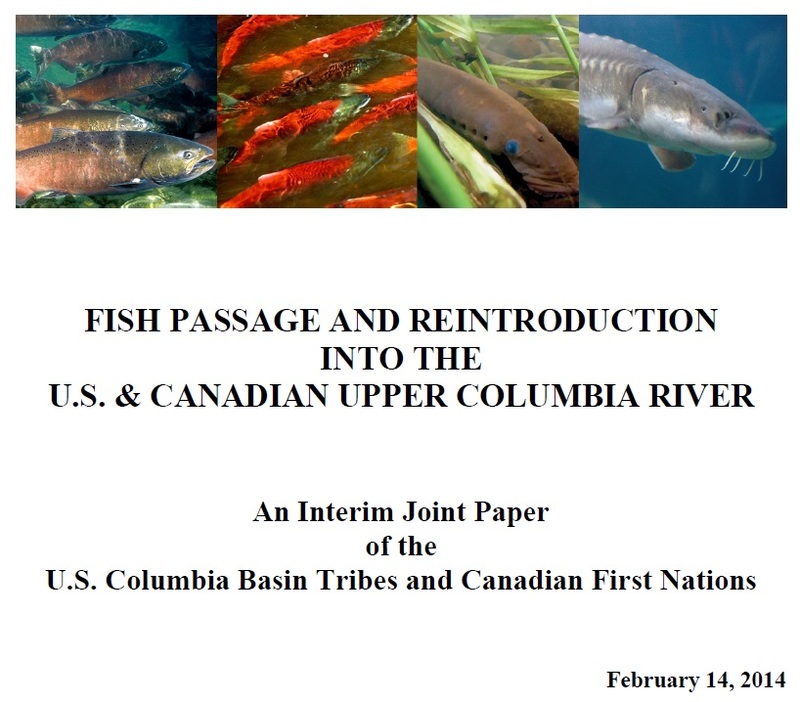 Read the Proposal from U.S. Columbia Basin Tribes and Canadian First Nations here. CELP has been working with a coalition of environmental organizations, in alliance with the Columbia River Tribes, to urge the State Department to modernize the Columbia River Treaty to include restoring the ecosystem of the basin. The Bonneville Power Administration (BPA) and the Army Corps of Engineers agreed that the 1964 Treaty, which expires in 2024, should be expanded to include the ecosystem as a third priority—in addition to the current priorities of generating hydropower and flood control. What does including the ecosystem in the Treaty mean? Well, it could provide an international platform for the United States and Canada to jointly plan for reintroducing salmon to the upper Columbia Basin. Obviously, this is incredibly important to the Columbia River Tribes and First Nations who suffered incalculable cultural, economic, and spiritual losses when dams, like Grand Coulee, were built on the Columbia River without fish ladders—blocking salmon passages above them. Renegotiating the Treaty is also important in the face of climate change. The best climate science tells us that the United States’ side of the Columbia Basin is going to get significantly warmer in the next decades, and we will continue to lose snowpack that provides the water salmon need. The 49th parallel will then become not just a dividing line between the US and Canada, but a dividing line between where there is and is not snowpack and refuge for fish and wildlife. 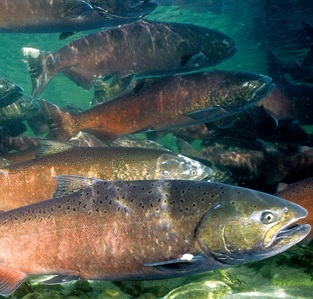 To keep salmon in the Columbia River basin, and, for that matter, in the greater Northwest, we are going to need to work with Canada to open up this cooler habitat if possible. Click here to Read the Proposal from U.S. Columbia Basin Tribes and Canadian First Nations. 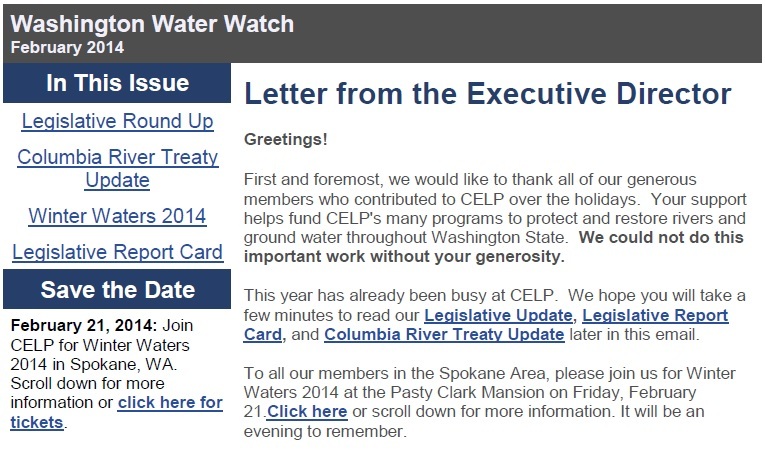 CELP’s February 2014 edition of Washington Water Watch is now available online! It includes our Olympia Round Up and Legislative Report Card as of 2/14/14. Click here to read the most recent edition of Washington Water Watch. You can click through to our Facebook page here and choose “Join my List” in the right hand corner to be sure to receive these updates in your inboxes from now on.